I have yet to find anywhere online Margaret Sangers letters or book excerpts that are quoted so often. Im no fan of hers but i dont just take what people write as proof. can someone please provide links to her letters where she calls black people weeds? or openly says she wants to exterminate black people? or something i can point to as proof to others her true intentions as claimed by so many? Re: Margaret Sanger Sources ...? Read her books, not excepts. Sorry, but there is no quick and dirty way to knowledge. You have to put the research time in. Go to the gutenberg.org or manybooks.net and download them. At first I was not convinced, but I actually read her books. She starts off like what you would think a 1920's feminist would write about, but you quickly realize her hated of all except rich white folks. It wasn't just people of color she hates and thinks should be sterilized--poor whites are just as bad in her book. Part of research is obtaining sources. Does anyone here have any specific sources they can point me to? I'm not going to read an entire library of this womans books just to find one Quote. If claims are going to be advanced about the woman give a reference. I can point to specific speeches by Hitler (Speech of April 12, 1921) where he blames the Jews but no one can point to just one page in a book or letter from Sanger that illustrates her hatred for blacks and other minorities? 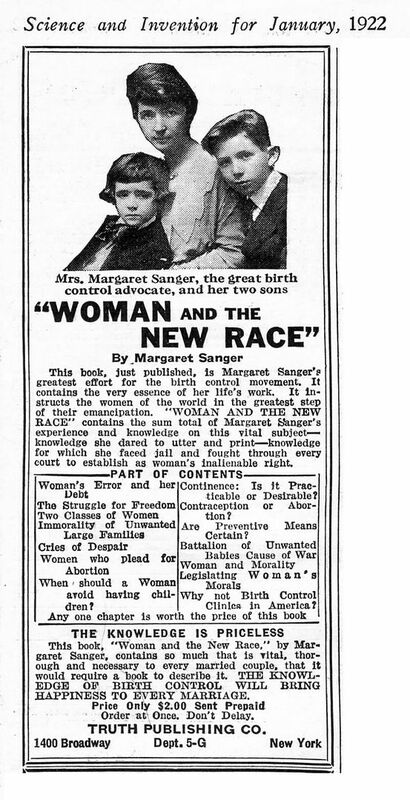 Many people conclude Margaret Sanger is a racist because of her association with eugenicists she worked with and allowed to publish articles in Birth Control Review when she was editor. Margaret Sangerâ€™s December 19, 1939 letter to Dr. Clarence Gamble, 255 Adams Street, Milton, Massachusetts. Original source: Sophia Smith Collection, Smith College, North Hampton, Massachusetts. Also described in Linda Gordonâ€™s Womanâ€™s Body, Womanâ€™s Right: A Social History of Birth Control in America. New York: Grossman Publishers, 1976. I recommend you read her book Pivot of Civilization. @2Revolutions TYVM for the sources. That's a great start. I have read alot of opinions about the woman with some offhand quotes but no one seems to link sources anymore. Her letters you would think would be most incriminating. Thanks again.